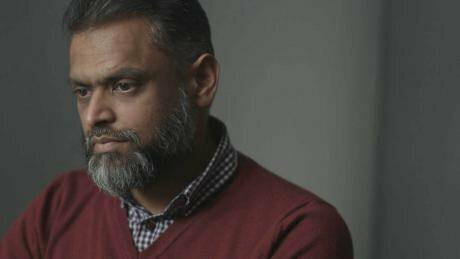 Moazzam Begg, The Confession, documentary still. All rights reserved.RB: I’ve been asking myself what is so brilliant about your choice of subject. 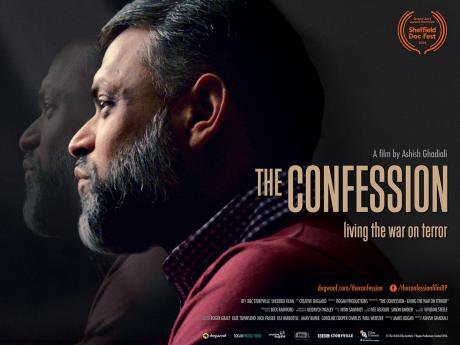 Your film, The Confession, invites Moazzam Begg, who so many coercive institutions have tried to silence, simply to speak as a human being, which he is very good at. Whereas some of us might assume from the title that what we have here is the subject of a Christian spiritual autobiography, in fact the last role that he seems inclined to play is finding out whether or not he is damned. In these terms, he remains elusive. Maybe that is part of his impact. But the point is that this is not so much about him as us. It is such a good litmus test for the remaining decencies, the ones that come between us and all that fear-mongering. For our capacity to see that someone who is Other is still a human being, and that this is much more important than all the fear. Is that a politics – I wonder? Maybe not, maybe it is something that only art can do? Ashish: No I believe it is a politics. However, art might be the key protagonist in bringing that into existence. The film is totally neutral, bare humanity, a little exercise in doubt and trust. What it actually is designed to do is to get a lot of very different people to sit in rooms together, and to feel each others’ responses and actually in a very modest way, because it is a little art house film, to experience a new type of nation. Maybe once you have experienced it once, that’s my hope, we may know how to make it again on a bigger scale and then a bigger scale. So, Moazzam Begg is currently denied a passport on royal prerogative. First of all you have to feel that something is not right about this, and then we can start to ask the bigger questions of what has brought us to this point. In the film I have made a great effort to present the narrative, a big thirty-year canvas that we can all live through, so that we can start to see how we got to where we are now. It is the opposite of soundbite media – it’s history! And people are feeling it. They are watching the film and feeling it. Some tell me that they don’t like Moazzam Begg at the end of it, but it was important to leave enough space for that possibility too. Rule of law, meanwhile, is a basic contract. Whatever our better future turns out to be, it will have to rehabilitate rule of law. Whatever you want to think about Moazzam Begg, whether he deserved it, whether he didn’t deserve it, whether he was naïve, whether I’m naïve – the film demands that you recognize that the rule of law, that quintessential British value, has not been exercised in our time. RB: Is it confined to the rule of law? When you catch yourself wondering why Begg got separated from his wife and child in Afghanistan, you have to ask yourself, as a friend of mine is always saying – what’s it to you? Why am I wondering this? Because once you start looking for holes, inconsistencies, lapses and ellipses, or even before you notice you are doing that… it is already a question of who gets to say whose identity is likely to be what, on the basis of fear? And everything deterioriates when that begins. Isn’t it much wider than the rule of law? Of course, Guantanamo Bay, torture, rendition, secret courts, this total disregard for people, innocent or guilty, and for the real causes of the conflict, is completely unacceptable…. Ashish: And that is the no-brainer. Once we have established how little the rule of law has been adhered to here, then we can move on. The basic frame that we are currently being asked to accept – and this is where any talk about maintaining BBC balance becomes completely unconvincing – is that there is a debate between civil liberty and the rule of law, and that we are a bunch of rabid lefties who bang on and on about civil liberties while we have no idea at all about the realities of terrorism. That is the argument of the right that I have heard expressed more times than I can remember during the making of this film. But we are going to have to find common ground, even within that frame, and here the crux of the matter is rule of law, it seems to me. I personally don’t think we need a rehabilitation of multiculturalism, because it is just the sea that we all swim in. All we need to do is to start celebrating it again. But I do know many people in the British establishment who are not at all convinced about that. And that’s fine. That is just a debate that will have to run its course. But are we really debating the rule of law? Because I haven’t yet met anyone who is going to come out clearly and say that this is what we are debating. And yet, and yet, we are! That’s my point. The counter-terrorism position that says, “Should Moazzam Begg have this platform to speak ?” is fundamentally saying that the question of rule of law that his story leads us towards is one that we should not be debating. Because the counter-terror argument is more important than the rule of law. That is the core of their argument. Rule of law has been undermined as an underlying principle of our society. The way that things escalate, like the many liberal organizations who succumbed under huge pressure and disassociated themselves from Cage when that organisation’s inept communications gave the media a chance to set them up for a populist response – that was the guillotine for the age we live in. This kind of escalation is not necessarily a conspiracy. It is just one move against another move and often those moves will take us further and further away from any semblance of where we want to be. Moazzam Begg is also a polarizing figure. For some he is a Nelson Mandela undergoing so much and then emerging seemingly unscathed and still willing to engage with people about it. For others it is precisely that quality which winds up so many. For them, that is an unforgiveable arrogance. I got an email the other day from someone telling me that they don’t want to come and see the film because they think Muslims should have less self-confidence and more self-criticism. But I’m interested in taking this polarising figure and creating an experience which is somehow unifying in spite of it, that transcends the polarisation. Of course, he is clearly a mesmerizing speaker and ultimately what drew me to the film more than anything else was that it was such a great story, one that takes us on this exhilarating ride through history. RB: It is certainly that. One episode, when the intelligence officer who sought out Begg in London, years previously, suddenly turns up in Bagram, reminds me of the dream navel of an eighteenth century Gothic novel! Only there it is the ‘just judge’ who appears in the middle of the Inquisition. It’s hugely gripping. But to return to your point - what reactions to the film give you most hope? Ashish: Last night in Cardiff, the host was asking me to talk about the set design, paint on the flats and so forth. He got himself overthrown by the audience, who literally erupted. They said, “No! We are not film buffs here! We just heard an incredible, astounding, human story and we want to speak to the man!…” They didn’t even put their hands up – they just started firing direct questions at him. It was very immediate. It was great. I have seen Moazzam speak in many different contexts, and his speaking is always well-formed and robust. He is well-practised at what he does. But that was always an obstacle for me in the film. If I had any doubt, it was about Moazzam’s well-honed speech being quite so well-rehearsed. And there always had to be a certain distance there, for me to be able to see around it. But what happened last night in the Q and A was that suddenly he was just there in the middle of it and talking to people and the buzz of energy that went out into that room had everything that we have been talking about: the polarization had been broken down, the awe, the caution, there was not even pity or shame – any of that. Just the feeling of a human being in probably an 80% non-Muslim audience, but with Muslims also in the room. One of the members of the audience was the Imam from the Grangetown mosque in Cardiff. That was the mosque used by the family of the first Britons ‘taken out’ in Syria by RAF drone strikes, ordered by Cameron without any parliamentary authority. The Confession: film poster. All rights reserved. RB: What will you do next? Can the BBC build on that DNA do you think, to replace the nation so enduringly created by Lord Reith, with your new nation? Ashish. I really believe in public broadcasting. But it’s very top down still. You can try to bring in brown faces, but a lot of the culture does seem to be too fear-driven. As far as the media is concerned, the top-down structures of the twentieth century are outdated and the digital revolution is well under way. This film’s influence is growing primarily through social media – a lot of social media. There is the presence of large institutions and that’s important, but the ability of digital communications to help to galvanise the niche audience turns out to be something quite significant for the fate of a film. The bottom line is that we need more democracy. The top down structures of the twentieth century are now outdated, and digital technology has created this possibility of self-organising models. In film that has allowed for distribution that isn’t so dependent on the person holding the big levers, and also in terms of new ways of marketing and building audience. But the money is still kind of holding this up. However the film could not have been what it is just at the behest of the BBC. They will do their own cut, of course. But the film is a co-production that has brought together BBC Storyville, the BFI, which involves a kind of theatrical distribution which is also digital, so that the film will release tomorrow on a whole load of digital platforms and in cinemas. Actually the BFI has been the main funder. The BBC was the first in and their editorial policy has been a benchmark for us that we are beholden to. But the BFI has been the lifeblood, giving us the scale of operations we needed, and the theatrical profile. This is something that is already happening in cinema – the idea that there are a whole load of platforms with different ways of telling stories and receiving stories, and that they can actually be mutually beneficial. But anyone at the BBC knows this too, that if you want people to watch your tv programme you have to do social media, to tweet about it, get it written about, get people to your platform even if it is mainstream tv. The difference is the numbers. There are just a lot more people turning on BBC1 and 2 than downloading from i-Tunes, unless you go mega on i-Tunes! So yes, the tour is essential to our film’s success, and Dogwoof, our distributor are the master-strategists on this. They basically built themselves up from the ground, originally working with campaign documentaries and building niche audiences for those campaigns, demonstrating that actually you can generate income by starting from those niches! RB: It’s the long tail! Ashish: That’s exactly what it is. So that is the world that is out there already, but it hasn’t translated into how the license fee is distributed. RB: Still the tour is a thing of genius because of the element of coming face to face with the subject of the film – which you can’t digitally copy… so those events are the one thing the digital revolution can’t do. They are unique and irreplaceable. RB: So you really did mean that this might be a way of imagining a new nationhood? Ashish: Yes. Yes I did.